That’s it, technology has finally reached its zenith, we can all pack up and go home. 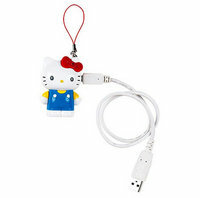 You can now buy a Hello Kitty phone charm that includes 512MB of data storage. And, what’s more, the USB cable plugs into Kitty’s brain, which is – I guess – preferable to it plugging up her bum. I hope I’m not seeing well and they’re not charging $70 for… this.